Two years ago, Tom Petty was standing in a Los Angeles courtroom. After two classic albums and a few so-so concert tours, the pretty boy from Jacksonville with the baby-fine blonde hair and vintage guitar collection was at the end of the line. Just another pretty face wasted, devastated, chewed up and spit out by the grinding rock 'n' roll machinery. Petty went through some soul searching times following his quick decline, clocking in lots of pacing, sleepless nights. Sometimes that's what it takes to make great rock 'n' roll music. 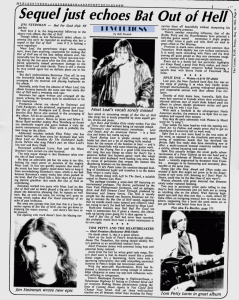 NEW YORK -- Relationships between rock performers and the large corporations that most of them record for are not always cordial, but few rockers have fought as many battles with their record company as Tom Petty and the Heartbreakers. The group's album Damn the Torpedoes was one of the best-selling rock LPs in 1980, but it was released only after a year-long contractual dispute that at one point found Petty filing for bankruptcy and ended only after MCA Records granted him the right to become the major artist on the smaller, more "personal" MCA subsidiary label, Backstreet Records. 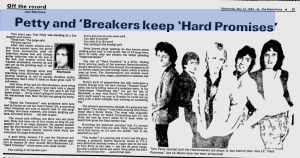 The just-released Heartbreakers' album, Hard Promises, was held up for a month by another dispute: MCA wanted to sell it for $9.98, and Petty insisted that it sell for the now-standing price of $8.98. No doubt about it, this is a great album. Hard on the heels of Petty's breakthrough release, Damn the Torpedoes, this outing should solidify Petty's position as an established musical force. Hard Promises shines with promises being kept and potential being realized. Aside from the fact he writes good rock songs, Petty's chief asset is that he doesn't sound like a professional singer. It's a fascinating, facile voice with a quavering vulnerability that adds compelling emotional textures to Petty's bright but bittersweet sound. 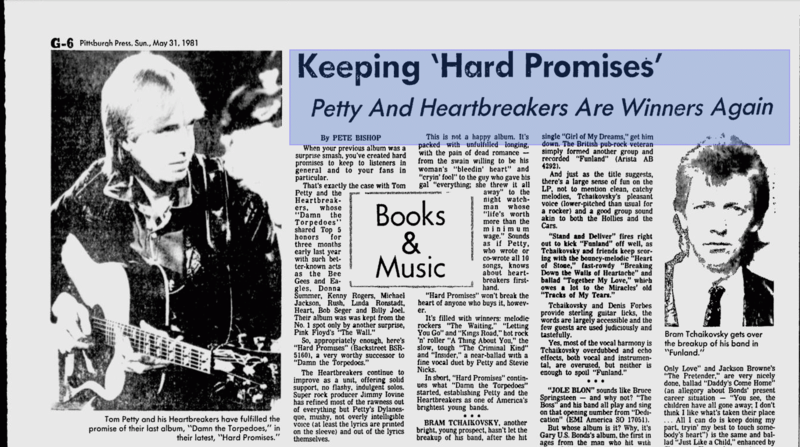 With the most-able Heartbreakers, Petty has fashioned a distinctive sound strong enough to acknowledge allegiance to some top pop-rock influences without suffering in comparison. When your previous album was a surprise smash, you've created hard promises to keep to listeners in general and to your fans in particular. 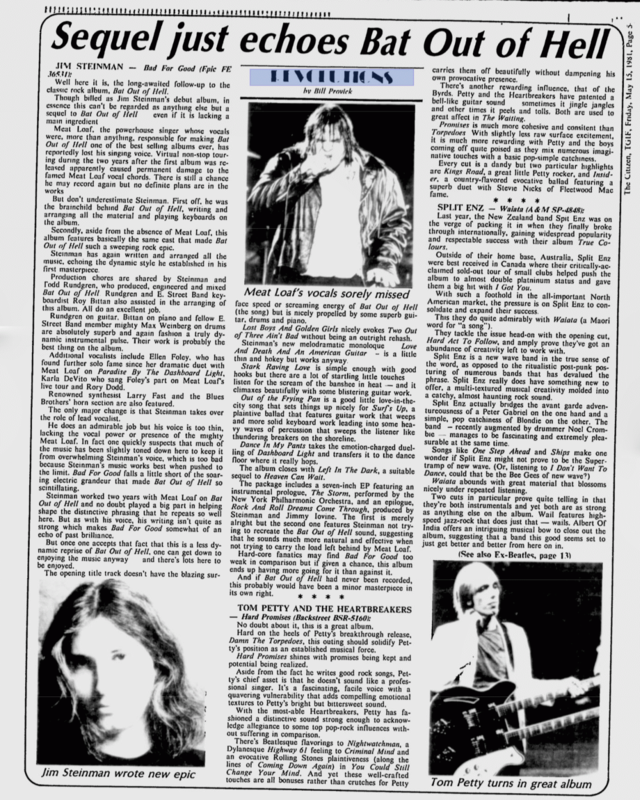 That's exactly the case with Tom Petty and the Heartbreakers, whose "Damn the Torpedoes" shared Top 5 honors for three months early last year with such better-known acts as the Bee Gees and Eagles, Donna Summer, Kenny Rogers, Michael Jackson, Rush, Linda Ronstadt, Heart, Bob Seger and Billy Joel. Their album was kept from the No. 1 spot by another surprise, Pink Floyd's "The Wall." So appropiately enough, here's "Hard Promises" (Backstreet BSR-5160), a very worthy successor to "Damn the Torpedoes." The Heartbreakers continue to improve as a unit, offering solid support, no flashy, indulgent solos. Super rock producer Jimmy Iovine has refined most of the rawness out of everything but Petty's Dylanesque, mushy, not overly intelligible voice (at least the lyrics are printed on the sleeve) and out of the lyrics themselves. Tom Petty's latest album, "Hard Promises," could just as easily have been titled "Hard Times (Hopefully) Past." 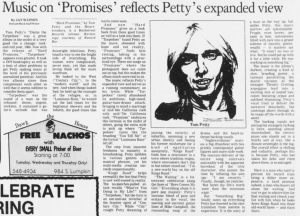 Despite Petty's tremendous commercial success -- particularly with his "Damn the Torpedoes" album -- it seems that he's always pulling himself off the deck from one personal or professional scrape or another. 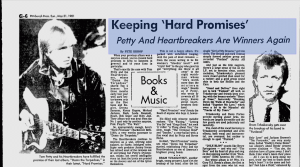 For example, Petty and his band, the Heartbreakers, originally were scheduled to appear at Centennial Hall June 1. When the show was canceled because of an injury to Petty's leg. Then it was rescheduled. Now, unless any other disasters befall them in the meantime, Tom Petty and the Heartbreakers will perform at Centennial at 8:30 p.m. June 14. It will mark the group's first appearance in Toledo. "Hard Promises," by Tom Petty and the Heartbreakers, is a Backstreet Records release. Review copy courtesy of Record Bar. Tom Petty's "Damn the Torpedoes" was a great album in the midst of a very good (for a change) rock-and-roll year, 1980. Now with the release of "Hard Promises," "Torpedoes" appears even greater. It took a 1979 bankruptcy as well as a host of other problems to get Petty making music at the level of his previously unrealized potential. And his two albums since then complement each other so well that it seems sublime to consider them apart. "Torpedoes" was the sound of a man on the rebound: dense, urgent, reckless, it contained a go-for-it attitude that was downright infectious. Petty found a way to see the bright side of everything. His woman were complicated, never easy, yet that made loving them all the more wondrous. He looked to the West ("Century City"), to the "modern world" and the new. And when things looked bad, he held up the example of the refugee, or, in "Lousiana Rain," he waited out the bad times for the baptismal showers and the rebirth, the good times that had to come soon. Hard Promises -- Tom Petty and the Heartbreakers (Backstreet-MCA): The Waiting, the very first song on the first side of the new album, opens with the strum of a 12-string guitar, the clink of a tambourine, and the high winsome wail of a none-too-sweet voice -- and I think I'm back in Byrdland. Petty's come even closer to the sound of Roger McGuinn's old Byrds than on his previous album, Damn the Torpedoes. All guitar bands are in debt to the Byrds, those "folk-rock" pioneers who put electricity into zingy harmonies and social consciousness into lyrics. Petty's resemblence is closer than most, though, and it gives his music extra force. Unlike the Eagles-Jackson Browne gang, Petty puts a raw flatness into his performance. No glow; like McGuinn, his voice is edgy and insistent. His lyrics are more direct, neither cynical nor mystical. True enough, the new album is somewhat more introspective, but Petty remains a rocker, able to charge along King's Road or A Thing About You. 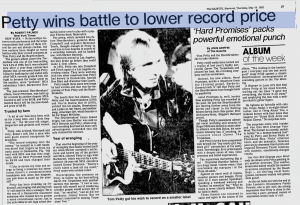 The record promises a substantial show at Cobo tonight. Editor’s Note: This is an Icelandic article and my translation of it. If you actually know Icelandic and would like to improve it, please contact me. A sfðasta ári sendi Tom Petty frá sér plötuna „Damn The Torphedos" sem af flest-um var talin afbragðs plata. Það er alltaf svo að hljómlist-armönnum reynist erfitt að fylgja metsöluplötu eftir á sannfærandihátt, oft er skotið yfir markið i þvi augnamiði að þjóna plötukaupendum. Tom Petty brennir sig ekki á þessu, ef eitthvað er þarf þessi plata itarlegri hlustun en hin. Hins vegar hefur Petty skipt niður I fyrsta gir og ef til vill sakna aðdáendur hans kröftuga rokksins. Mér hefur ætli fundist Petty dálitið mistækur þó oftast takist honum vel upp, — og mér heyrist hann misstiga sig dálitið i nokkrum lögum á nýju plötunni. Byrdstfllinn er pinulitið yfirþyrmandi á köfl-um, en við flest lög á plötunni má bærilega una. 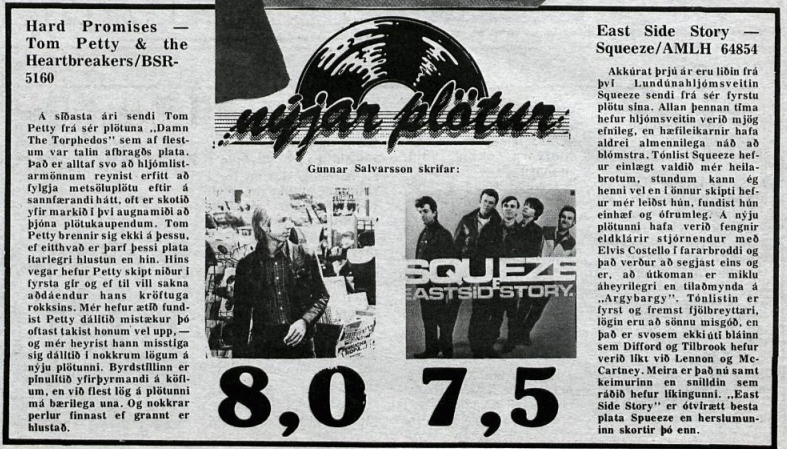 Og nokkrar perlur finnast ef grannt er hlustað. Last year from Tom Petty, we heard the album "Damn The Torpedoes," which was considered by most to be an excellent album. 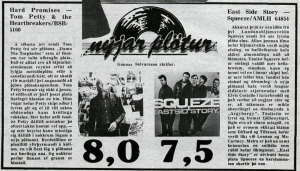 It is always so in music that it is difficult to follow a best-selling album, which is often shot over the goal to serve the record buyers. Tom Petty burns himself up on this, if something is needed on that album for the advanced listeners. However, Petty is divided into first gear and maybe his powerful rock is missed by fans. I have found Petty maybe a bit erratic, however, most will take it up -- and he missed his step in a few tracks of the album. Byrdsian is a little overwhelming at times, but most of the songs on the album are acceptable comparisons. And if carefully heard, some gems can be found. 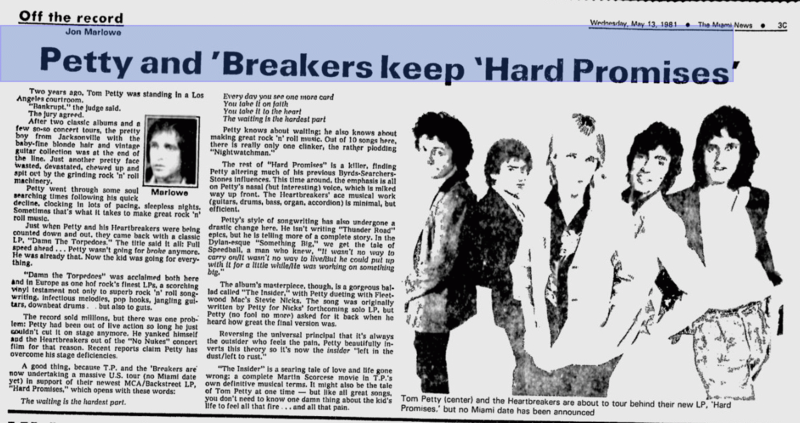 Tom Petty and the Heartbreakers -- 'Hard Promises' -- (Backstreet) -- No doubt about it, somebody wants to make sure Tom Petty remains a star. Every song on the new LP just strains to be cataclysmic, and there's even a superstar guest appearance by the highly-marketable Stevie Nicks. Thus the album is even more "accessible" (critical euphemism for "commercial") than Damn the Torpedoes. Not that I'm accusing Petty of selling out, you understand. Any guy who makes the record company charge $8.98 for an album they wanted to charge $9.98 for can't be all bad. The truth is, this one just ain't worth it at any price. The damn thing calls in that irritating area between disgraceful and laudatory, that sort of no man's land in which it difficult to either like it or hate it without feeling remorse. It's neither bad enough to inspire scorn nor good enough to inspire anything else. For instance, there is nothing on the first side that is veritably bad. Instead it comes off as merely disappointing, and the first two songs even sound like vintage Petty. There's a jubilant willfulness to lines like "You take it on faith / You take it to the heart" that makes "The Waiting" instantly gratifying. It's reassuring to know that he still believes. Similarly, the anguish of "A Woman In Love (It's Not Me)" is genuinely plaintive, despite the smarmy Pablo Cruise-y refrain. There's a wonderfully poignancy moment when Petty exasperatedly intones the finest lines of the album: "Time after time, night after night/She would look at me and say she was lonely." Now that hurts, and the bitter irony of the dilemma is accentuated by the flawless inflections of Petty's vocals.